Over 17 years LED Driver and electronic ballast manufacturing experience, and over 15,000,000 installation sites worldwide. Compare our competitively priced LED Drivers and Electronic Ballast products and customer service that is second to none! 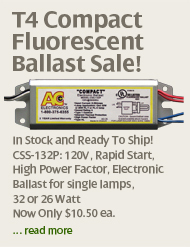 RoHS Compliant Ballasts are one of AC Electronics' ways to create products that help our customers improve their environmental and operating performance.